This post by Jon Udell was originally published on the MisinfoCon blog on 18 Oct 2017 and is reposted here with permission. In February of 2017, the W3C approved standards [1, 2] for annotations to text, images, audio, or video. They matter to the struggle against misinformation in the very particular way I’ll discuss here. 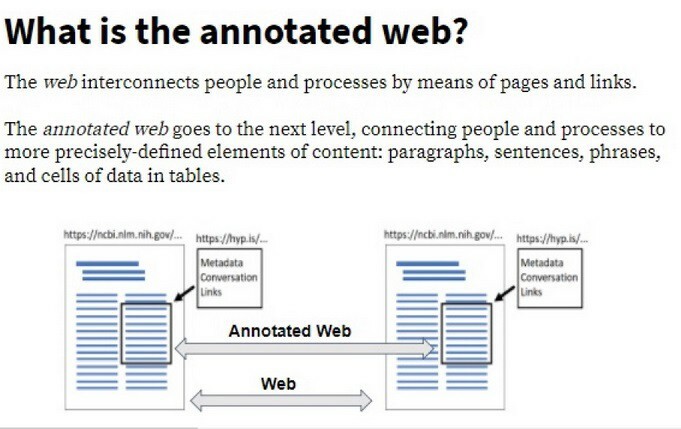 But first, a quick primer on web annotation. In text, annotations attach to paragraphs, sentences, phrases, numbers, or anything you can select. The annotated web uses enhanced URLs to connect annotations to such selections. 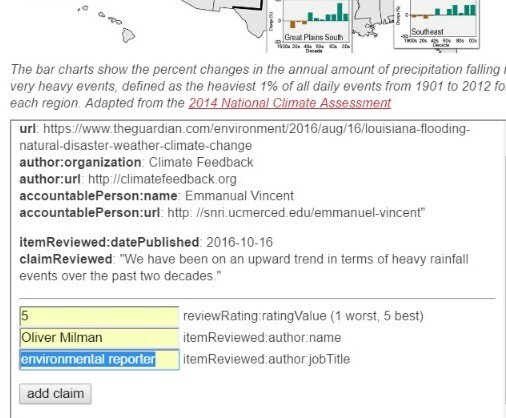 An annotation is a package of data, plus a description that connects the data to a selection in a page. 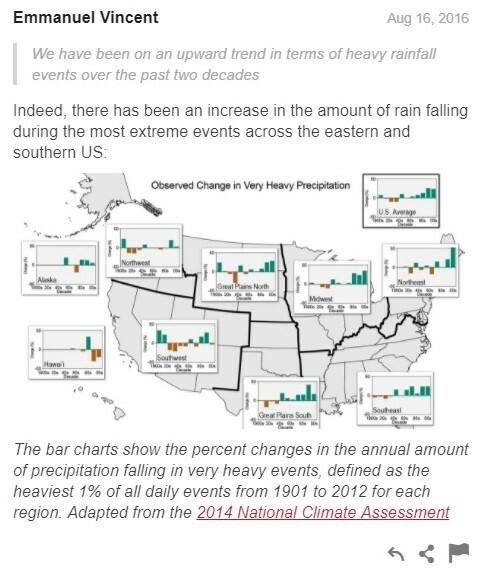 We have been on an upward trend in terms of heavy rainfall events over the past two decades, which is likely related to the amount of water vapor going up in the atmosphere,” said Dr. Kenneth Kunkel, of the Cooperative Institute for Climate and Satellites. Dr. Vincent’s note includes a comment, a chart, and a link, all written in the freeform text format supported by the Hypothesis annotation client. His note can serve as the root of a threaded conversation conducted openly, or in private group spaces. Now let’s add a second annotation that refers to the same selection. It’s created by a human using an enhanced annotation client, or by a robot recognizer/classifier. Either can deliver a payload of structured, machine-readable data, governed by a standard vocabulary or schema, perhaps including a rating. This second annotation enables a reader to view the claim through lenses provided by human curators, artificial intelligences, and — most powerfully — people and machines working together. This review, which attaches to the same sentence that Emmanuel Vincent annotated, will be found by a search for the annotation’s URL, its author, its group, or its tag. Readers can watch activity connected to the target sentence, robots can ingest and analyze that activity, publishers may or may not choose to display it. As we battle misinformation, we are creating many different systems that people and robots will use to check facts and classify statements. They all share a common pattern: reference to selections in web documents, and attachment of data to those selections. So here’s the call to action, to builders and funders of such systems in particular. Build on a common foundation: the annotated web. Jon Udell (judell@hypothes.is) is Director of Integration at Hypothesis. He is grateful to Dan Froomkin, Joe Germuska, and Dan Gillmor for feedback on an earlier draft of this article.